Start finding your next solution with this newly revised whitepaper. Some construction companies hesitate to upgrade beyond their old software and spreadsheets because they assume the cost of a modern software solution will be astronomical. But today’s cloud ERP systems are designed to give growing companies access to their business tools and information, on any device, anywhere, anytime—while only charging them for the computing resources they actually consume. In other words, if you choose the right cloud ERP, you’ll get software that enables your growth rather than stifling it. Learn how to start your selection process with a new and improved whitepaper from SMB Group. 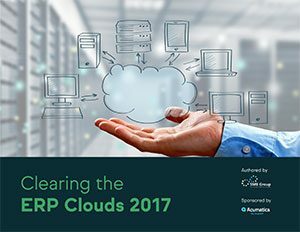 The top eight reasons your smartest rivals are choosing cloud ERP. Which of the three types of cloud ERP deployment is best for you. What Faux Cloud ERP is and how to avoid falling for it. Why everything you’ve heard about cloud security may be wrong. How to make sure you never get stranded on outdated software again. Don’t miss these insider tips every construction firm should have. Just enter your information and this whitepaper will be yours in seconds. This eBook is offered by Acumatica, a leading provider of cloud business management software that gives mid-sized customers a complete, real-time view of their businesses—anytime, anywhere.